"The Arctic - brilliant white, radiant blue, jet black: this is how the land shines in the sunlight, with a fairy-tale beauty. Point to point, summit to summit, fissured, wild, like no other place on earth". These were the words of Roald Amundsen after his first navigation of the North-West Passage. And indeed: the Arctic Cruise is a gateway to a fantastic world, untouched by human hand. The Arctic Cruise - where it takes place and when to go. The name "Arctic" is derived from Ancient Greek and means something like "the land under the constellation of the Great Bear". It extends above the continents of North America, Asia and Europe and can only be accessed using special icebreakers and expeditionary ships. The best time for an Arctic Cruise is between June and September. Discover the wonders of the Arctic, for example, in the largest city in the north of the kingdom of Norway, Tromsø. With its central market place, Stortorget, Tromsø offers wonderful opportunities for strolling around the shops and relaxing. The Scandinavian country itself captivates with its dark green mountain ranges and imposing fjords such as, for example, the famous Geiranger. Furthermore, the Arctic Cruise takes you to the Land of the Cold Coasts, otherwise known as the Arctic island group, Svalbard, with its principal island of Spitsbergen. Visit walrus territory, where the animals make themselves comfortable on giant ice floes, and watch out for polar bears suddenly emerging from the mist. This area of approximately 62,700 sq km is home to a mere 3000 people. An equally significant and noteworthy destination on an Arctic Cruise is the world's largest volcanic island, Iceland. Explore Europe's second-largest glacier, Vatnajökull or watch the antics of the cute polar fox and observe the bird life in its majestic diversity. The capital city,Reykjavik offers an amazing view from the top of its principal landmark, the 73 m high tower of the Hallgrímskirkja.Your journey then continues to the world's largest island, Greenland. This Danish possession is best-known for the Greenland ice sheet, which covers about 80 percent of the land area. A special place to visit is the house of Santa Claus, which is to be found at Uumannaq. According to the Danish embassy, each year letters addressed to Father Christmas come from children all over the world and arrive at the Post Office in Greenland. In southern and eastern Greenland, the ice-blue glaciers are interspersed with fertile valleys and landscapes, presenting nature lovers with the most fantastic scenery. Go on an Arctic Cruise and get to know Alaska, "the big country". Discover Alaska's northernmost point, Point Barrow, and visit the Eskimo settlement of Barrow. Or you might decide to visit the city of Nome on the Bering Sea, famous for its dog sleds. Numerous imposing mountain ranges and gigantic glaciers round this experience off to perfection. One of the highlights on an Arctic Cruise is the world's fifth-largest island, the Canadian territory of Baffin Island. It is in the sea arm between Greenland and the Canadian Arctic and is characterised by dramatic glaciers and deep fjords. Here you can get to know the life of the Inuit at first-hand and, with a bit of luck, if you're there in the late Arctic summer, you will see the mystic and spectacular northern lights. 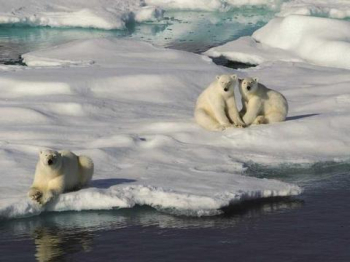 The Arctic Cruise - a special experience for adventurers and discoverers.